Welcome to Loose Cannon Customs, San Diego County’s premier custom shop. Whether you’re interested in classic restorations, custom airbrushing or just an amazing head-turning paint job, our team can make it happen for you. We love to paint, and we’re proud of our work. We invite you to browse through our portfolio by clicking on the “Our Work” button on the left, or simply stop by our shop in Santee to see what we’re working on today! Looking for a one-stop-shop to handle your next restoration? See why so many of your fellow classic car enthusiasts have trusted Loose Cannon Customs to plan, manage and execute restorations and dream builds. Having successfully restored hundreds of complete cars – always with the highest feedback from our customers – we have the expertise to help you plan your budget, source all parts and get your car back on the road in all its glory. If you want to get it done and get it done right, look no further than Loose Cannon Customs. It’s not easy to look at a car as a paint canvas, but once it’s done the results are incredible. Rest assured that your project will be in good hands with Artist Nick Battaglia, a man who can transform old rusty sheet metal into one-of-a-kind artwork. In fact, Nick has been painting for over 20 years and, not surprisingly to his many fans, has won numerous awards for his work. Take a look at some examples of his airbrush artistry in the “Our Work” gallery on the left, or stop by the shop and see his work in person. 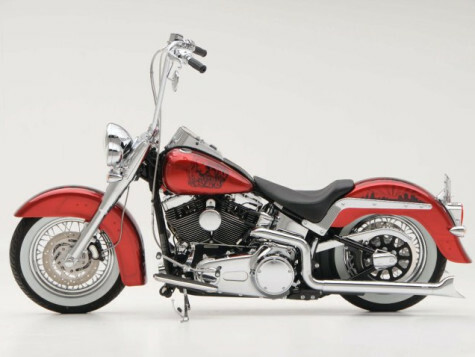 Bring us parts or bring us a complete bike and we’ll get the job done just the way you envisioned it. 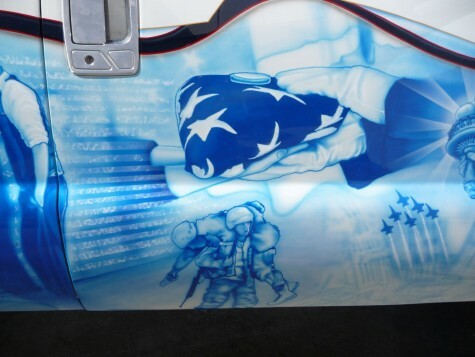 Whether you want a single color or eye-catching custom airbrush work, Loose Cannon Customs is here for you. We’ve done it all, from Hondas to Harleys and back…and bikes are one of our favorite types of work to do at the shop. We can also do damage/dent repair on gas tanks, fenders, saddle bags and more! There was a time when every custom shop had pinstriping expertise. Now it’s a lost art which has only been mastered by a select few – including our very own Nick Battaglia. 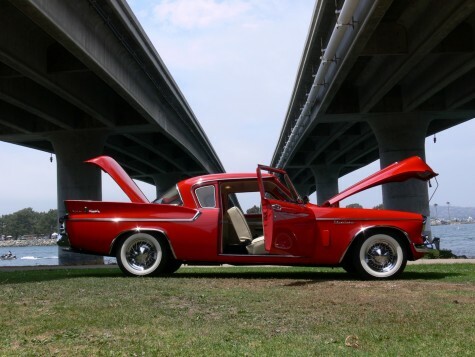 Popular on 1950-60s era hot rods, the style is back and in demand. Choose a full blown pinstriped design or a subtle pinstriped touch. Either way it will make a huge difference for your piece of art. Loose Cannon Customs proudly offers pinstriping for cars and bikes as well as other objects. Bring in a helmet, guitar or even a piggy bank, and we’ll stripe it up! You’d be surprised how far a paint job can go. 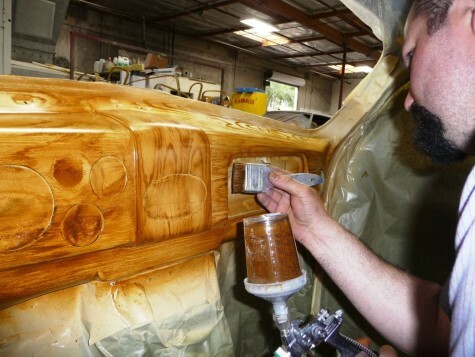 We can simulate the look of wood grain, rust, aged patina, chrome and much more! Want a one of a kind look without using digitally printed graphic wraps? 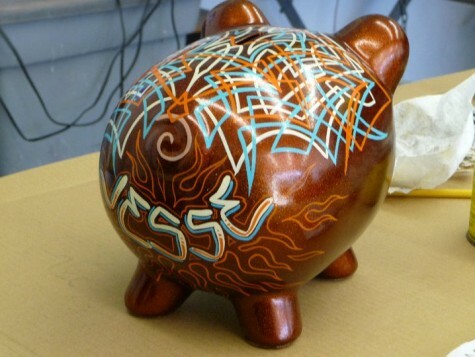 Let us go above and beyond with a one-of-a-kind design or finish for your very own project. One of the coolest things we can do is simulate the look of wood grain. The look is almost indistinguishable from actual wood and we can even shade to any color/wood grain style of your choice. Come by and see for yourself! Who says helmets can’t look as cool as your bike? 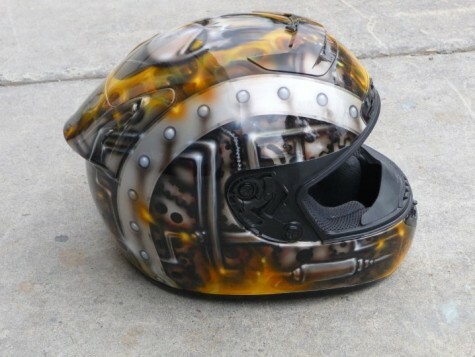 At Loose Cannon Customs you can have your motorcycle helmet custom airbrushed to make a statement that is uniquely yours. Have a particular design in mind? Let us airbrush it into reality. Want a simple pattern or hot rod-style flames? Having painted hundreds of custom airbrushed helmets, we’ve done it all. Just tell us what you want and we’ll sketch it out for your approval before starting on the final design. It’s that easy. 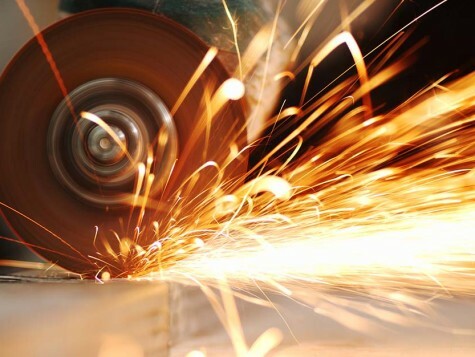 From metal fabrication to fiberglass fabrication, our wide range of experience allows us to do any type of job and custom make almost ANYTHING. Modify your car or bike, create a metal structure for an art project or manufacture your own fiberglass racing parts. It is all possible here at Loose Cannon Customs!